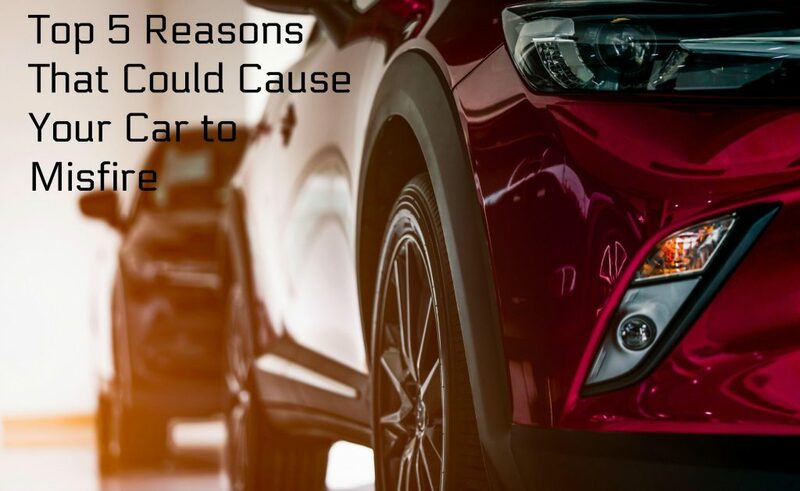 There are a number of reasons why a car misfires. Before moving on to what those reasons could be, it is essential to understand what the term “misfire” means. The term “misfire” simply refers to incomplete combustion in the cylinder of a car. When the condition becomes severe, you will feel a jerking action from the engine. -Over a period of time, it is natural that the ignition cables and coil, the spark plugs, and the distributor cap or rotor experience a certain degree of wear and tear. -This could lead to a dilution in their ability to transfer the spark required to ignite the air-fuel mix inside the combustion chambers. -While in the initial stages the misfire is usually weak and difficult to identify, however, once the issue becomes severe then you could feel a jerk or your car engine could even backfire producing a loud popping sound. -For this reason, it is essential to conduct routine maintenance work or take your car in for scheduled servicing. An imbalance in the air-fuel ratio or lean misfire as it also called (little fuel and too much air) can also cause your car to misfire. You will feel the misfire when the car is idling more as opposed to when the engine picks up speed, and the car is running. Successful combustion requires the fuel ratio to be higher compared to the air mix. If you have a bad air sensor, a weak fuel pump, or a fuel filter that is clogged up, it could lead to an imbalance in the air-fuel ratio. In certain cases, the reason behind a car misfiring could be mechanical in nature. -If there is wear and tear in parts such as the piston rings, valves, camshaft lobes, the and cylinder walls, then the car could misfire. -This could also happen when there is an intake manifold gasket leak. -Other mechanical issues could include a bad fuel injector or any kind of damage or wear and tear to the rocker arms. -You should also check the timing belt to ensure the installation is correct or to make sure it has not slipped. -Anytime the misfire is caused due to mechanical issues you will feel a thumping sensation from the car. Unlike in a lean misfire where the condition gets weaker or disappears as the engine picks up speed, you will feel a continuous thumping even at high speeds if the misfire is mechanical. A problem in the transmission could also cause your car to misfire. -If you find that your car is jerking you around, the problem could actually be because the transmission is unable to shift up and down properly. -The condition will be felt when you are cruising at high speeds and it could be because of a problem in the functioning of the overdrive gear. -If you feel the car jerking when decelerating, it could be because of hard transmission downshifts, or a problem with the brake pads. A proper check-up of the car will help in identifying the problem area. -A problem with the ECM or the central computer of the car could affect the combustion process which in turn could lead to the misfire. -To reverse any problems with the ECM all you have to do is disconnect the battery of your car and then reconnect it. -If the misfire was caused due a minor glitch in the computer system, then doing this should be able to effectively address the misfire. -If however, even after disconnecting and reconnecting the battery, you find the issue to be unresolved, it is best to visit your dealership and have the central computer examined thoroughly. Identification of the real reason behind a car misfiring can only happen after detailed inspection. If the real issue is not identified, or a wrong diagnosis of the problem is made, it could lead to replacement of the entire engine! No One Gets it Done Like Accurate Service! If you are car is misfiring in Tucson or in the Tucson area, or if you have any other issues with the running of your car, our team of expert mechanics at Accurate Service can help you. Give us call today at 520-620-9129 or schedule an appointment online according to your schedule!